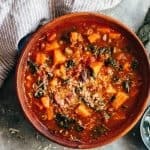 Winter Vegetarian Minestrone Soup is a hearty, healthy soup that uses up all the fresh winter veggies and beans which are simmered in a tomato base. Its gluten free and vegan and only needs one pot. Heat olive oil in a large pot and add garlic, onions, celery and carrots. Saute for a few minutes till the onions start turning translucent. Pour in the jarred marinara sauce along with water, oregano, chilli flakes, butternut squash and salt. Give it a quick mix, cover and let this simmer for 15-20 minutes till the butternut squash is fork tender. Add kidney beans and french beans and simmer for another five minutes. Lastly add the chopped kale and turn off the flame. Cover and let this rest for 10 minutes to let the kale wilt. You can top this soup with grated parmesan, sour cream or olive oil for additional yums. Store bought marinara sauce can be substituted with canned tomatoes or fresh tomatoes + tomato puree. If you do so, add more herbs to the sauce to make up for the flavour. I would add dried oregano, basil and thyme. Cooked kidney beans can be substituted with cannellini or basically any beans of your choice. You can also add cooked lentils to the soup. Kale can be easily substituted with spinach if that’s what you have on hand.